Manchester United midfielder Paul Pogba is reportedly being eyed up for a transfer back to his former club Juventus. The Italian giants have shown their ambition in the transfer market in recent times with big moves for players like Cristiano Ronaldo, Gonzalo Higuain, Emre Can and Aaron Ramsey. And a bid to re-sign Pogba could be another huge statement of intent from Juventus if they pull it off, with Don Balon talking up such a possibility. It does look as though the France international’s future with Man Utd is in some doubt right now, with Marca claiming he’s keen on leaving to join Real Madrid. Don Balon, however, claim he’d also be ‘seduced’ by rejoining Juve now and playing alongside the likes of Ronaldo and Paulo Dybala. Paul Pogba to leave Manchester United for transfer back to Juventus? 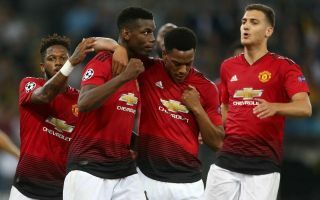 United will surely do all they can to hold on to Pogba at the moment, however, with the 26-year-old hitting some of the best form of his Premier League career since Ole Gunnar Solskjaer replaced Jose Mourinho in December. It would be nonsensical for the Red Devils to buckle and allow Pogba a move away now, especially as they’re under little pressure to do so unless a truly seismic offer comes in for him.